A little fun never hurt anyone. But a little Mani always does. 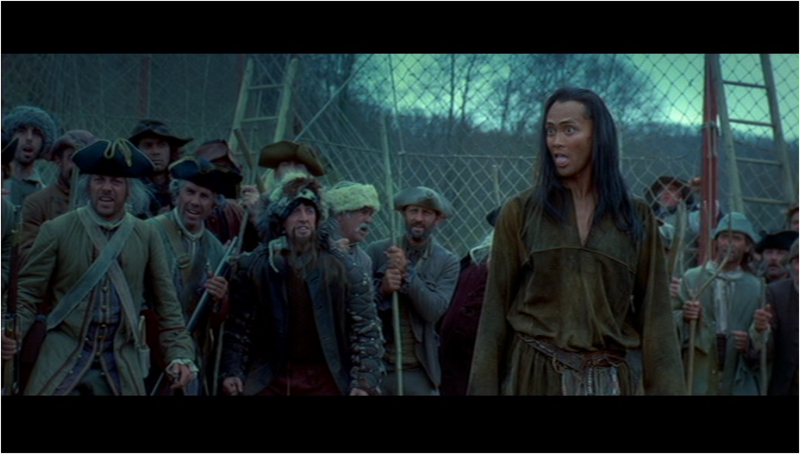 Mani, everyone’s favorite kung fu Iroquois. He’s now let his hair down in every sense of the word. 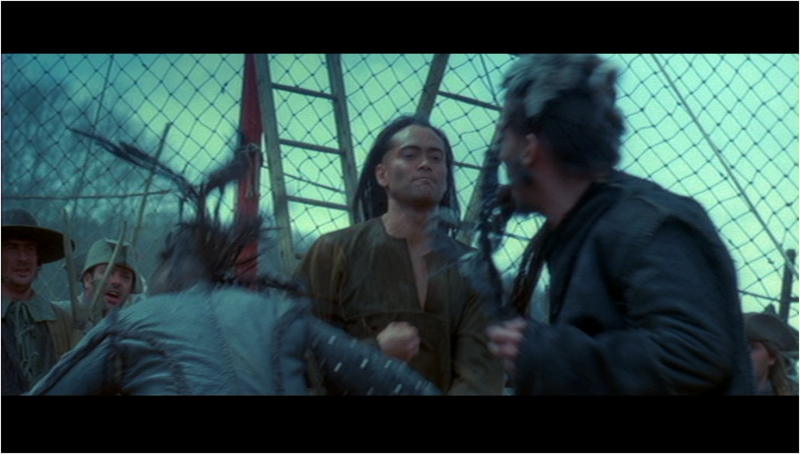 Played by Mark Dacascos. Several gypsies, including two women. They’re ostensibly here as part of the hunting party that’s being assembled to catch the Beast, but they’re actually working for the film’s villainous cult. The males are especially weird, with all sorts of feathers & braids in their hair, and they stick out their tongues a lot like a dime store Kurgan. It’s pretty silly. Played by a bunch of stunt people and bit actors. Armed with: Most of the guys have these weird hook/claw attachments on their hands, but they don’t break them out until near the end. The Setup: As our heroes prep for the big hunting party, Mani has another encounter with the strange lady he saved earlier. She starts getting harassed by a couple of the gypsy dudes, whom she seems to know, but her attitude about it changes from aggravated to aroused (?) when she catches Mani watching. The action cuts away from the meeting, but when we come back, Mani is brawling with the two knuckleheads who’d been pawing at her, while she cheers it on with the crowd. This girl is one of Brotherhood of the Wolf’s more maddening aspects. She is never named in the film (the credits apparently list her as La Bavarde, which Babelfish says is French for “the talker”) and she barely speaks, yet she instigates a number of important events and the camera seems to treat her like an important character. It’s never really established what her “deal” is; her father seems to be a pretty nice guy who’s just caught up working with the villains, but she’s more or less full-out bad. Mani is inexplicably (and, eventually, fatally) intrigued by her, again for reasons that are never clear. She also seems to despise Mani despite him saving her & her dad, and she has this weird love/hate relationship with the male gypsies. Oh, and she has some form of epilepsy that only manifests once in the movie. You’d think that her character had a bigger role in some scenes that were cut, but if those scenes exist they’ve never made their way to a home release I’ve ever seen or heard of. As it is, La Bavarde just hangs around irritatingly on the story’s periphery, acting nasty and starting trouble like the 18th-century version of a Jersey Shore cast member. The Fight: Mani first faces the pair of gypsies who’d been messing with La Snooki, and though he clearly outclasses them he actually takes his time to beat them up, using more elaborate & showy movements, and even returning their physical taunts. He’s treating this like it’s a game, which is basically what it is. The crowd that gathers is rowdy but not really bloodthirsty, and even Mani’s friend Fronsac doesn’t try to stop it, though that’s mainly because he knows Mani is in no danger. The gypsies may increasingly feel their pride is at stake, but for everyone else this is totally schoolyard. Mani finally takes the two chumps out of commission, and is almost immediately greeted by two new challengers– a couple of not-so-lovely ladies wearing men’s clothing. They stride toward him in faux-seductive slow motion, clearly relishing the challenge. Mani seems perplexed at this development, and trades a priceless glance with a visibly amused Fronsac. The not-so-ladylike ladies come off a bit better than their male counterparts and are nearly as agile as Mani, but still can’t measure up. After some cool, almost dance-like fighting, he knocks them silly and is greeted with four more male gypsies, this time with their claws out. The music immediately switches up from playful to a bit more serious, but Mani is unfazed, dodging & smacking down just as before. He takes out the final two with a nifty flip move that puts them down hard. Mani stands around cockily enjoying himself, but doesn’t seem to see a fifth gypsy (presumably one of the original fight starters, but it’s hard to tell these guys apart) try to rush up and claw him in the back. But that gets the kibosh put in it by the mysterious Jean-Francois, who shoots the gypsy right through his claw hand. It’s all fun & games until somebody gets shot while attempting a dishonorable murder, so the fight ends after that and the crowd dissipates. This is, once again, quite entertaining. It escalates the level & complexity of combat in the film and indulges in some fun silliness (as opposed to the previous fight in the rain, which was also silly but in a very melodramatic, po-faced sort of way). Although its primary cinematic purpose is to inject a bit more action into a scene that otherwise didn’t require any– there hadn’t been a fight in a little while and won’t be another for quite a bit more– this sequence also serves a clever secondary role of memorably introducing the gypsies, who serve as the villains’ henchmen. Two birds, one stone. So a nice bit of action filler and some more groundwork is laid for what’s in store. Not too shabby. Coming Attractions: That freaking Bavarde ruins EVERYTHING. This entry was posted in Brotherhood of the Wolf and tagged Brotherhood of the Wolf, martial arts, melee.